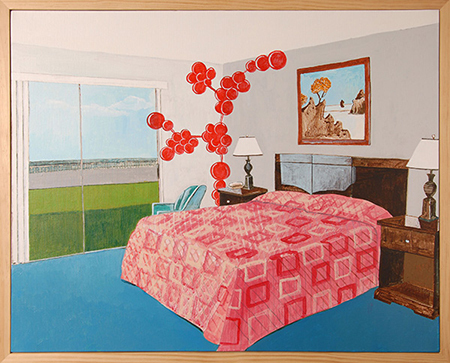 Rory Devine, "Untitled (Ocean City)," 2013, acrylic on canvas, 24 x 30"
Rory Devine's solo exhibition "Tragic Kingdom," together with a group show he curates titled "Capture the Rapture" share a common vision and sensibility. Devine's examination of the complexities of life coveys a melancholic nostalgia laced with irony through the numerous images he sources from specific Google searches. Devine has long melded the personal with the universal. The gallery is filled with realistic and abstract paintings on canvas and paper that illustrate Devine's deft hand and rendering abilities. He also adds an installation/sculptural element. In his previous show he filled the floor with black balloons that slowly deflated. In "Tragic Kingdom" a red curtain spans the back wall in front of which sits a ventriloquist's dummy that is, so states the artist, similar to one he had as a child. The installation includes beautifully rendered head shots of the doll. These small paintings, hung in a line above the desk, underscore the emotional element of the exhibition. Who speaks for whom and how and why do things go wrong (for example a painting of Kurt Cobain as a child is titled "Before I grew up and hated myself") are implicit questions raised by this work. There is the suggestion of hope that there is a way to see beauty in the chaos of contemporary life. Devine's curatorial effort in the accompanying group show further underscores the sentiment. Abstract paintings by Jack Davidson, Karin Davie, Mary Heilmann, Robert Levine, Laura Owens, Karen Schifano and Monique van Genderen explore the power of color and line to "Capture the Rapture" of the medium.